Pattern Sniffing – After students see a pattern I find they continue, using that pattern, for a while before thinking about a generalization. So, maybe “Extending Pattern Using the Pattern” comes after this in my mind? Wondering – When they wonder, they definitely look at relationships, but I am not sure they wonder if it will always be true at this point? Now that I just wrote that, I am thinking maybe “Extending Pattern Using the Pattern” comes after this one? I don’t know where this fits necessarily, if it is embedded in one of them, or if it really fits at all:), but there is a point where mathematically students prove a generalization works with certain number and not others because “the numbers have to work that way” (structure) without the conceptual proof of why that is. For example, “Even dimensions of a rectangle will give you an even area.” Students can make the statement that it has to work every time because when you multiply even numbers it is always an even product….true, but isn’t there proof to that. So, it is like a string of proof by depth? Investigating and Explaining Why – I feel the relationships and patterns question to themselves comes back up here too. *Chatting with Tracy after I wrote this, she was focused on mathematicians, not students. I find some holds true in both cases to different sophistications. Hope that helps a bit Tracy! Hopping on a plane but as soon as I have wifi I will add a couple more question I have to think about around this! 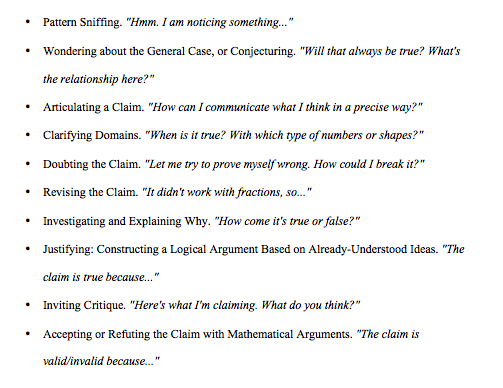 This entry was posted in Generalizations, Making Claims and tagged Generalizations, making claims, Math reasoning on June 27, 2015 by mathmindsblog.